This past week I had jury duty. My first reaction was one of annoyance. I’ve done a lot of jury duty, even one stint for three months. So as far as I was concerned, I’ve done my time. But then I thought again. It’s an enforced day of quiet. I promptly changed my schedule around and planned my reading accordingly. First were some back issues of The New Yorker. Then, much to my delight I was going to be able to read Paul Lisicky’s The Narrow Door. The book came out the day prior to having to serve and I made sure I had my copy. Years ago when I walked downtown to the courthouses, just north of the Brooklyn Bridge, I had a clipped pace and could make the five-mile trek in 90 minutes. But this time it took me 110 minutes. 20 minutes longer than in the past. It wasn’t the cold weather. I walked throughout the winter in the long trial. Though cold and windy, I enjoyed the empty sidewalks allowing me to walk with ease. Perhaps the 20 minutes isn’t so bad given it was 20 years ago when I moved quicker, getting to my destination with time to spare. But I did notice I’m losing some stamina. I enjoy walking just as much as I did in the past, but I’m slower, tending to walk shorter paths. 20 years ago I’d walk to and from 100 Centre Street, last week one way was more than enough. I also started noticing that I’m doing less outside of work. I’ve always been a busy person, mainly pursuing the arts such as exhibits, theater, films, and the occasional dance performance or opera. Now I’m more selective, finding I prefer to rest more. I guess I couldn’t keep up with my previous pace. And, I suppose I don’t have to. Losing a minute a year for a five-mile walk allows me to enjoy more of the scenery on the way. I’m 54 years old, I have a torn meniscus, pleural effusion, tendonitus, and I completed a half marathon today. I love walking but never thought I could run. Thanks to my friend Lisa, who told me I could run slowly, really a jog, so I tried it out and found that I could jog slowly. I started running at the age of 51. I ran around the block, then a half mile, then a mile. I always felt like I accomplished something doing these runs. Little by little I challenged myself to jog longer, always slowly. I would have people pass me on a regular basis. At first this was difficult. I can be competitive. With three siblings, it was a survival tool growing up. So doing this for me and not trying to keep up with other runners might have been a bigger challenge than the exercise aspect of the sport. I ran my first races the past year. In the Fall, I ran a 5K, then a 5 mile. The five kilometers was not that difficult. I had been jogging regularly and was prepared to be one of the last runners. It was a less popular run, so there wasn’t a big a crowd, which I liked. 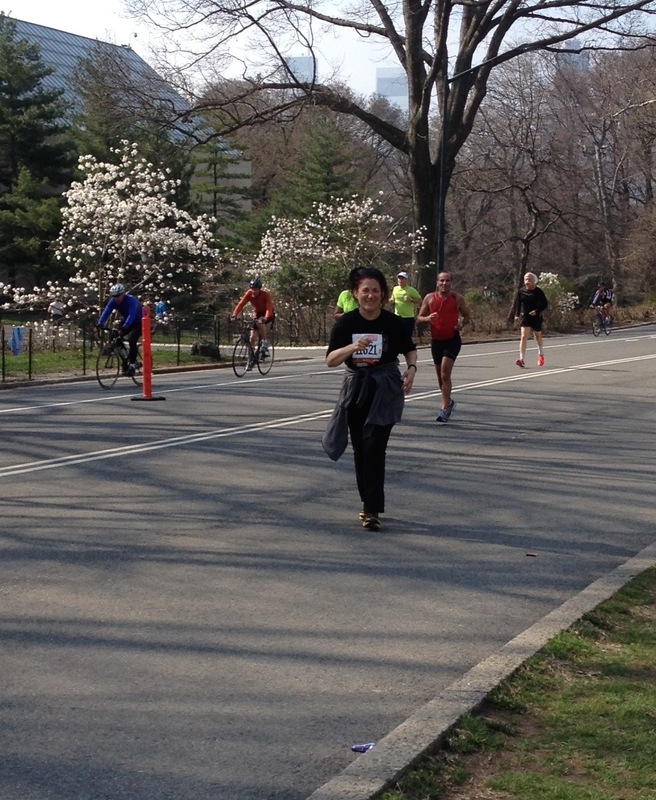 The following day I ran my first NYRR race in Central Park. There were a lot more serious runners. Volunteers often shouted out to go faster. I ignored their encouragement. For me the running is not about the time, it’s about doing it. On New Years eve, I did the four mile Central Park Race at midnight. It was fun starting off with fireworks. I have been inspired by friends and family who are runners like my writing classmate, Jeannette, who made sure I had energy snacks for the today’s race, and gave me good tips on self care. Larry’s cousin, Zena, is a runner and she put the idea in my mind when she said she was training for a half marathon. I’m so fortunate to live in a city with a lot of opportunities to run. And, I’m lucky to have friends and family who are supportive. 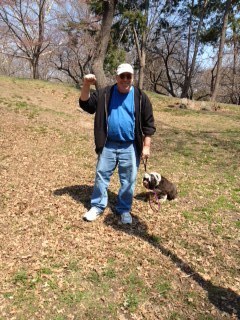 Larry was out early with Lucy and they were my cheering squad. The cheered me on twice around the park, and then at the finish line. It really helped me to keep going. It feels good to do something for myself. My body is sore,and I’m exhausted, but I’m proud to have completed the half marathon. In the end, slow and steady won my race. I was 11 years old. In the back of our school in Cherry Hill, New Jersey, in 1971, I ran the 900-yard dash. On the dirt around the playground I pushed myself as I ran as fast as I could. Again and again my classmates past me, even tough my mouth was dry, my chest was tight, and the left side of my abdomen was in a knot. I had on my red Keds. They were not serving me well. Three classmates were behind me when I reached the finish line. There was little pleasure in that. I knew I was not a runner. I took this knowledge with me for a long time. I liked to walk and I enjoyed walking for miles in the city, my favorite mode of transportation. Often joggers passed me by, and I looked at them as if they were another species. Friends of mine would speak of their runs, their races, their ability to go miles in any type of weather. Not me, I just walked. And, then two years ago I tried to run. A friend suggested I could run a slow pace, so that I could be gentle on knees, and not hurt my lungs. It worked. As 70 year old runners passed me by, I started out jogging a quarter mile, a half, and then one full mile. It felt great. I liked it. I could do something I never thought I could do. And, then this past weekend, I ran my first races. Yesterday I walked to Randall’s Island and slowly but surely ran the 5K, or 3.3 miles. Because I am so slow, I had a lot of space between me and the next runner. I happily passed walkers, but wasn’t even close the other runners. I didn’t care. This was for me, and I could put one foot in front of the other towards the finish line. It felt good to complete the race. Larry, my husband, and Lucy our Tibetan Terrier were there to cheer me on coming an going. It was so nice to have them there. 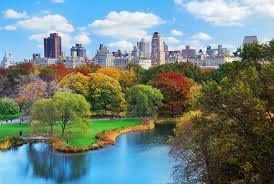 And, today I was in Central Park to run a five-mile race. I don’t know my time. I didn’t even bother to find out. For me, the fact that I was there was enough. I have no designs on a marathon. Being able to run at all is a win for me.